We know that cell phone usage needs are different for each of us. So, to help you find the plan best for you, we have optimised our results for three different profiles of consumers. The average user plan: For those who need some data (2 or 3 GB) in addition to unlimited calls and texts. The intensive user plan: For those who need to always be connected online, and want choose 6 to 8 GB of data. You can benefit from the NO-CLAIMS BONUS data being offered right now! It is a simple plan. Make calls for only 20$ per month. 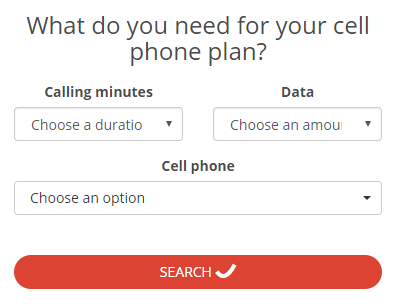 Public Mobile’s “Ready-Made – No Data , No Text – Unlimited Province-wide calling” plan is the best plan in this category at the moment. Do you use mobile data for all the normal purposes? Such as – to send e-mails, to go on Facebook, instagram or Twitter etc? Freedom Mobile’s “Home 2GB with Digital Discount” plan offers not only unlimited calls but also 2 GB of data for only $40 per month! Do you like to be connected online at all times? Do you stream music or watch movies and TV series on your phone on your morning commute? Then right now, Freedom Mobile’s “Big Gig + Talk 5GB + 3GB Bonus with Digital Discount” offer of the moment is the plan for you.